The productivity of the UK workforce remains slightly lower than in 2007, marking an "unprecedented absence" of growth since World War Two, official figures show. The Office for National Statistics (ONS) said UK labour productivity fell 0.2% in the last three months of 2014. That meant productivity last year remained "little changed" on 2013. The Bank of England has previously raised concerns about productivity levels. The ONS said labour unit costs - otherwise known as employee benefits, which include wages, pension contributions, bonuses and other benefits such as private healthcare - had increased by only 1% a year over the last five years. The figures come a day after the ONS revised fourth-quarter GDP figures, which led to annual economic growth being uprated to 2.8% from an earlier estimate of 2.6%. The economy is a major theme of this year's general election, with Labour arguing the economy's recovery from the financial crisis has been the longest and shallowest on record. The Conservatives have pointed to the fact that there are more people in work than ever before and that wages and living standards have begun to rise. While the UK now has historically high levels of employment, the Bank of England has suggested many people may be underemployed. It has previously suggested the economy may have as much as 1.5% spare capacity, meaning the economy is performing below its potential because of a lack of productivity in the workplace and underinvestment by business. Another possible explanation for low UK workforce productivity in the years since the financial crisis is that businesses refrained from making staff redundant where possible, while freezing or cutting salaries instead. The Bank of England says that as the economy improves, more businesses will begin to reinvest in expansion, which should lead to improved productivity. The Bank expects that as the economy reaches near full employment, pressure for wage rises will also increase. The ONS said last month that average pay had risen by 1.8% in the three months to January compared with a year earlier. And on Tuesday, it said household disposable income edged up 0.2% in December 2014 compared with May 2010 - the first increase in living standards recorded under the coalition government - equivalent to £10 a year per person. 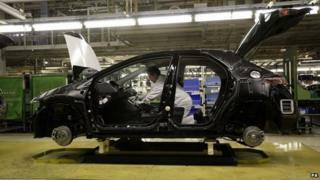 It comes as a closely watched survey suggested activity in the UK manufacturing sector hit an eight-month high in March. The Markit/CIPS purchasing managers' index (PMI) for the month rose to 54.4, up from 54 in February. Any reading above 50 indicates growth, while a figure below 50 means a fall in activity. Manufacturing production grew at the fastest pace in nine months, Markit added, helped by the strongest increase in new business since July 2014. Rob Dobson, senior economist at Markit, said: "The UK manufacturing sector has continued its bright start to 2015, with March seeing the headline PMI rise to an eight-month high. "The sector is on course for output growth ranging around 0.6% over the opening quarter as a whole, a positive contribution to broader economic expansion and its best performance since the first half of last year. "Continued job creation of around 5,000 new manufacturing employees a month also provides a decent bellwether that the labour market is still strengthening."